The step pyramid of King Djoser sets the mood for the whole Saqqara necropolis. Djoser was the 1st king of the 3rd dynasty and ruled Egypt for some 20 years. His Horus name is Netjerykhet Djoser. 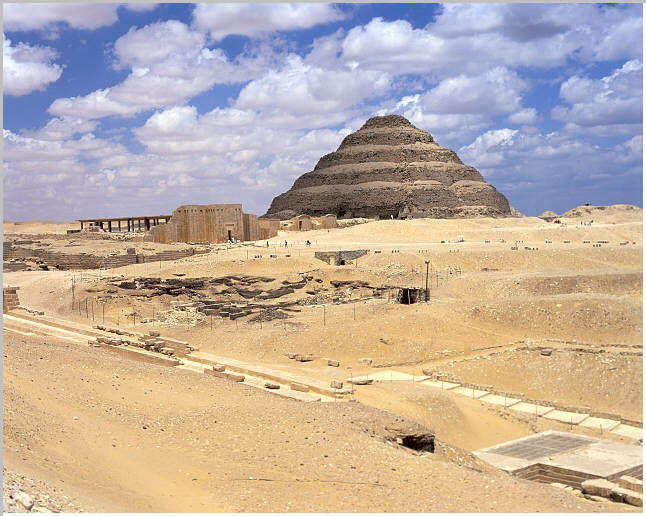 The step pyramid bears witness the a series of enlargements. The structure was started as a masataba and enlarged twice. It was further enlarged to a 4 step pyramid and finally to its current 6 step shape. What we see today is mostly thanks to the 70 years of work by Egyptologist Jean-Philippe Lauer. Originally the pyramid was encased in fine Tura white limestone, some blocks still remain in situ on the east side. Here viewed from just south of Unas's causeway we can see the whole Djoser complex. In the left middle ground is the reconstructed perimeter wall with the entrance colonnade immediately to the left. In the background is the step pyramid of Djoser. In the foreground to the right is wonderful dual mastabas of Niankh -Khum and Khum-Hotep, the twins.